Text and photos by Lindsey Johnson for Design Mom. In March and April, eggs go on sale at the market, so this is an ideal time to learn, or improve, our egg boiling skills. You may have big plans to dye some Easter eggs, or maybe you’re just craving an egg salad sandwich. 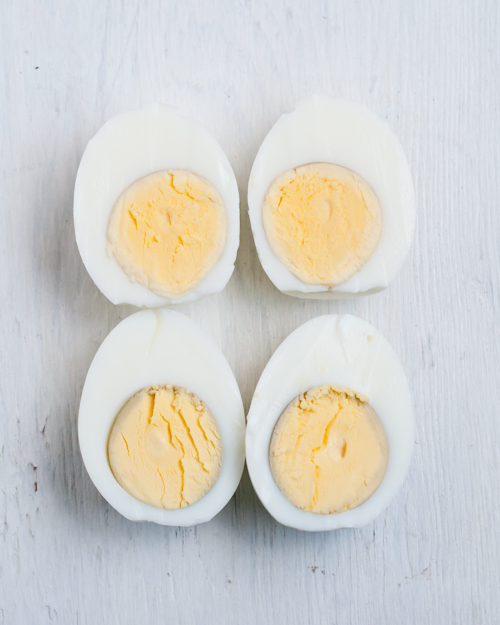 Either way, knowing how to perfectly hard-boil an egg is a skill everyone should have. 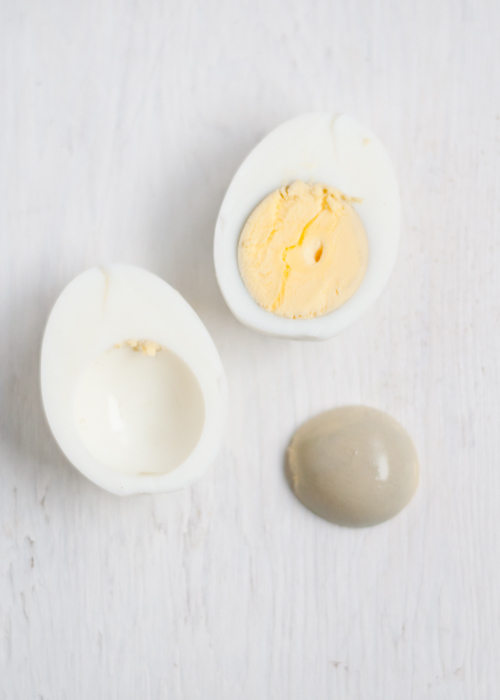 Do you ever peel and cut open an hard-boiled egg only to find a pesky grey-green ring around the yolk, or that the yolk is still a little raw? I’m here to help! And soon you’ll be an egg-spert and be able to show all your friends how easy it is to hard-boil eggs. Put the eggs into a deep pot in a single layer. Secret #1: Fill the pan with cold, not hot, water. The goal here is to bring the eggs up to boiling temperature along with the water, which will also help prevent cracking and promote even cooking. The eggs should be covered by 1-2 inches of water. To measure, dip your finger in and touch an egg. If the water reaches anywhere between your first and second knuckle, you’re probably good to go. If not, add a little more. Bring the water up to a boil. Secret #2: Let the eggs boil for one minute, then cover and remove from heat. The heat in the water will continue to cook the eggs after they are off the burner. 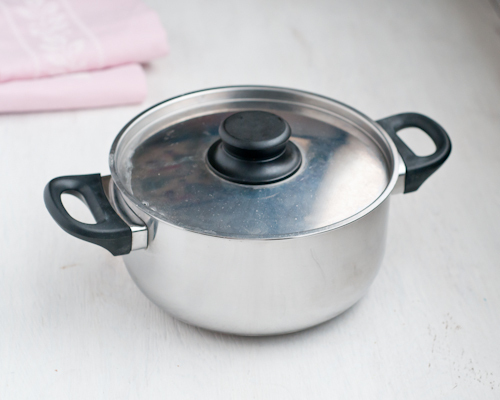 If you have an electric stove with coil burners, you can skip boiling the eggs for one minute because the burner will retain heat. Let the eggs sit in the covered pot for 12- 15 minutes. Secret #3: The actual time is going to vary a bit due to the size of the eggs. Medium eggs will take less time, about 9 minutes, and extra large eggs will take more time, about 15 minutes. The altitude where you live will affect the cooking time as well. I live at about 5,000 ft. above sea level, so I keep the eggs cooking in the covered pot a few minutes longer so the yolks aren’t too raw. Plan on practicing with a few small batches till you get the timing just right. Next step is Secret #4: To stop the cooking (and avoid over-cooking) you’ll need to cool the eggs quickly. There are two options. You can gently drain off the hot cooking water and add cool water to the pan. Or, you can remove the eggs from the hot water with a slotted spoon and carefully transfer to a bowl of cool water. As I mentioned, this stops the cooking process, so be sure not to skip this step. Now we’ve come to the funnest part: peeling. 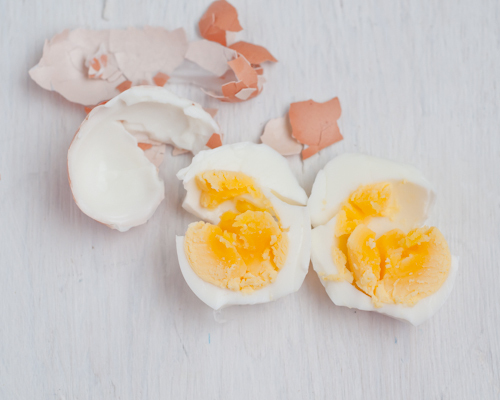 Secret #5: Cold eggs peel much more easily than warm or room temperature eggs. 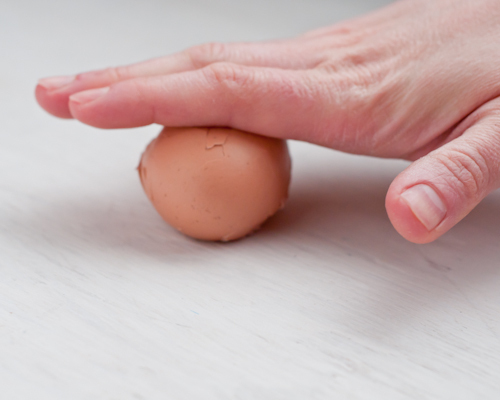 Begin cracking the cooled egg by rolling it gently against a flat surface, like a counter or cutting board. Go ahead and roll until the entire shell is covered in cracks. Then carefully peel the shell off. If the shell sticks to the egg white, help things along by either peeling under cold running water or in a bowl of water. I have also found that cracking the larger bottom end first, then rolling can help the shell come away more easily. Be sure not to crack it too hard or you’ll chance breaking the egg white right in half! Peeled eggs should be used very soon after peeling. 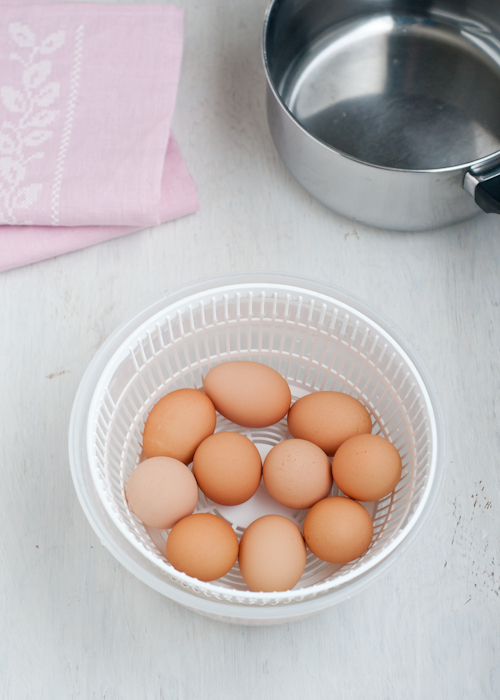 Unpeeled eggs should be kept in a container with a lid (to prevent odors) in the fridge for up to a week. 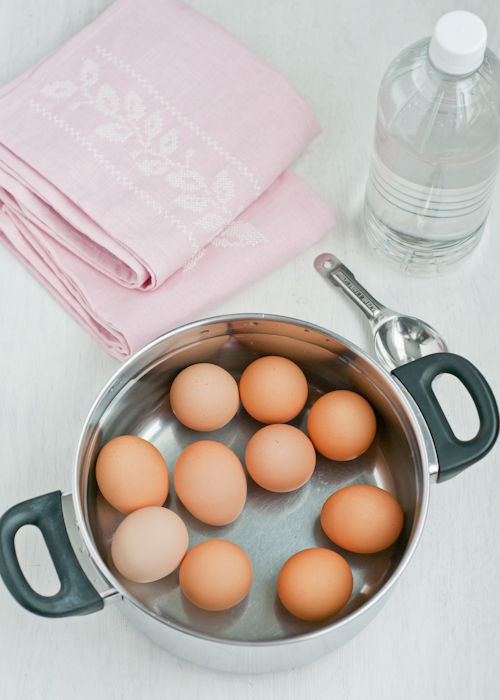 If your eggs are cracking during the boiling process, try this: add a little vinegar or salt to the water. The vinegar/salt will help any escaping egg whites coagulate and stop leaking out of the crack. Or, you can follow my Mother’s tip: prick the bottom of the egg, where there’s a tiny space between the membrane and the shell. The idea is to release a little bit of air. It’s supposed to help prevent cracking — and some people swear it makes peeling easier too! Found a grey-green ring? Don’t worry it’s not dangerous and doesn’t affect the taste of the egg. It’s just a little unappealing. That dark colored ring is a natural reaction between sulfur and iron reacting at the surface of the yolk and the egg white. It does mean that your hard-boiled eggs cooked for too long. Make a note of how long the eggs cooked and cook them for a few minutes less the next time. And that’s it! Now those hard-boiled eggs are ready for Grandma’s Deviled Eggs, dyeing with the kids, or eating as a quick snack or breakfast on the run. Now, please tell me, do you have any tips you’d add to mine? Have you ever tested and timed your eggs so that you know the exact amount of cooking time for your stove and elevation? I’d love to hear. P.S. — Save those shells! They can add extra calcium and other nutrients to your garden. P.P.S. — Love secrets? Find all the posts in this series here. Great tips on a skill everyone should have. Like clockwork, my brother used to call me every year the Saturday before Easter to ask how to hard boil eggs (my technique is very similar to this). His kids are grown now so it’s been a few years since I got the call but he has a grandson that is almost a year old so I expect the “call” tradition to return in a few years. I’m excited to try this, considering Easter is around the corner and I’m the only one in my house who eats hard boiled eggs! 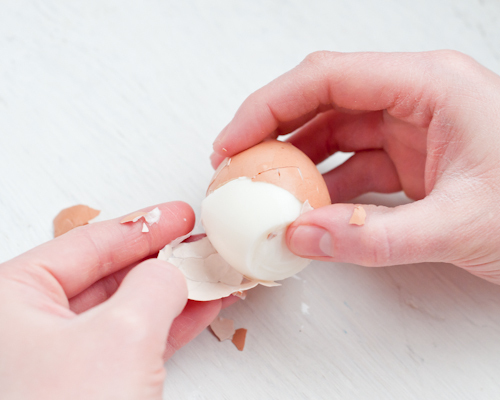 That’s true – do not boil really fresh eggs – you’ll go crazy peeling them! 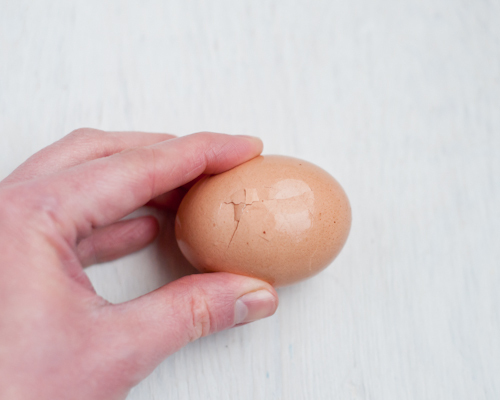 When peeling very fresh egg crack the large end first and pierce the membrane. Then leave in a bowl of water for 5-10 minutes. The water seeps in between the white and the membrane, making the membrane (and shell) peel off easier. Peeling can be my nemesis. Blah. Thanks for the tip. I just learned it takes 3 years for the eggshells to break down and release nutrients into the garden. So that’s a bummer. put the shells in a glass jar with a lid tightly closed under the sink. in about a week it will turn into black liquid it smells but it works a lot faster & is very rich. 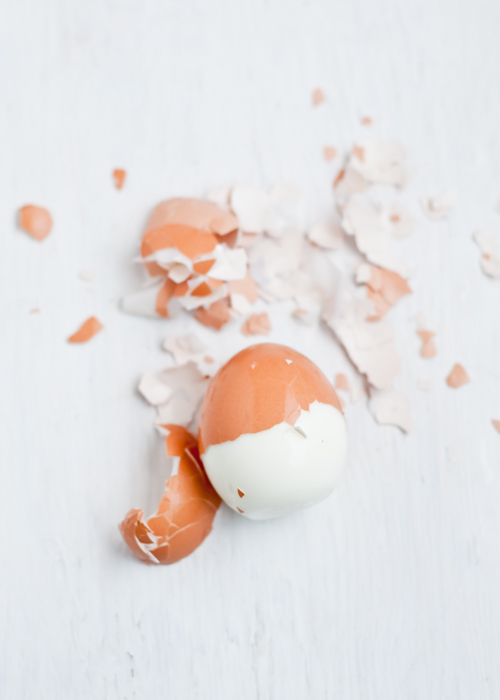 It’s difficult to save the shells from hard-boiled eggs–they’re usually not clean enough to grind, an essential step in breaking them down in small enough pieces for the garden. For all the other kinds of eggs–scrambled, over-easy, etc.–I usually quickly rinse the shells, then let them accumulate in a basket with a fairly open weave. When I have enough, (lots), and they’re all dry, I smush them with a potato masher, then run them through the Cuisinart. From here I add them to the compost, but they’re also fine enough to be added directly to the garden. I’ve never had a bit of luck deterring slugs using eggshells, though……. Haven’t tried it yet (though I’m set to tomorrow), but you can use the half shells for nursery purposes. Plant your seeds in the shell and then just drop into the garden. 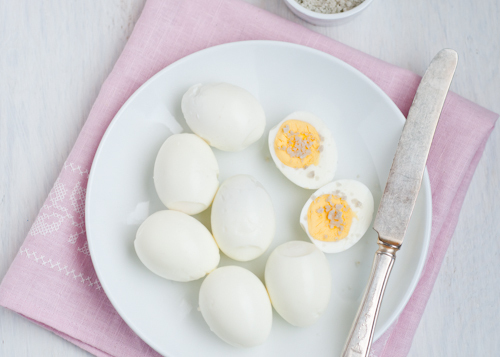 Just read new issue of Cooking Light & it recommended STEAMING eggs for easier peeling: http://www.myrecipes.com/recipe/deviled-eggs-pickled-onions-50400000126776/ Haven’t tried it, but I will – peeling is my problem!! My trick is to just use this egg timer… Works every time, I love it! I have the same egg timer as Robyn (I get them at Crate & Barrel) – I always buy a few because they are inexpensive and invariably someone says “where did you get that?” and I can give them one. As my kids like softboiled eggs for breakfast this is a really helpful gadget to have. I did appreciate all the extra tips about peeling and the idea for steamimg! I have tried the Japanese egg shapers (with varied results) which you have to peel the eggs whilst hot- ouch! You DO NOT have to peel while hot! Just peel the egg cool like you normally would, then sit the peeled egg in HOT, not boiling, water for 1 minute. Then egg-shape the heck out of it! Square, bunny, fish, star…it ALL works! As my eggs are boiling, I am putsing around on Pinterest, and come across this! I went right over and shut off the boil lol! I was told that the vinegar helps with the peeling. I prefer white vinegar as apple cider will darken your eggs. I didn’t have much choice but to boil fresh eggs this year – but I read adding baking soda to the water when you boil them is supposed to help with the peeling…. We’ll see how it goes! Worked like a charm! We colored them for Easter but I made an extra one to eat. Yummy! Thanks for the how-to! I know that I’m late to this party, but another way to check if your eggs are done but without sacrificing an egg, just spin your egg on the counter. If it’s hard boiled it will spin perfectly, if not it will be wobbly. Thank you for this easy step-by-step guide. I’ve been hardboiling eggs for years, but I’ve never tried this method. Tomorrow morning we’ll give it a go! I am very lucky that my 4-year-old son is much less picky than I was at his age (or at 16 for that matter). He LOVES hard boiled eggs and I can’t stand them. Still, I felt I owed it to him to learn to make them correctly. This came just in time for Easter and yours tips worked perfectly. Thank you! Can you suggest a cheap pan that could be used exclusively for boiling eggs? This was my first time making hard-boiled eggs! I was looking around the internet for perfect hard-boiled eggs, and I came across this. It is great! The one thing I can say is that if you leave the pot uncovered while boiling, it takes a lot longer. I ended up covering the pot and checking on the eggs every few minutes. Here is a tip I use to peel the shell off my eggs. 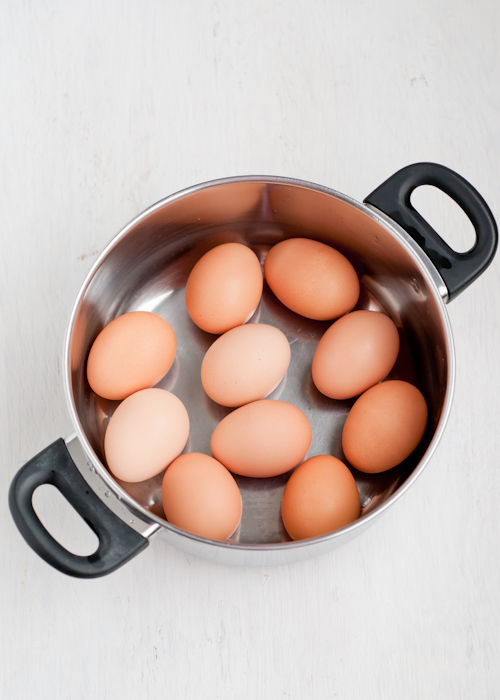 Once you get the eggs out of the boiling pot, place them in a cold water bath for 1 minute. You want them to be cool enough to handle them shell-wise but still medium hot on the inside. Find a hard edge surface and crack the egg in the middle going around in a circumference of the egg. 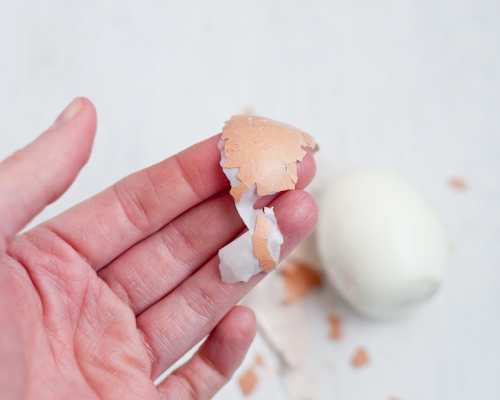 Once you get the crack started, take your finger and continue digging the crack until the whole circumference of the egg in the middle is showing egg white. Now it is really easy just to pull the whole top side of the shell off in one piece and the bottom side of the shell as well. I love hard boiled eggs. They’re wonderful convenience food – you can eat them on the run. They’re healthy and cheap and satisfying. And love your suggestion of turning off the heat and letting sit in the heated water – energy efficient! Thanks for the tips. Just made perfect hard boiled eggs! Yummy thanks! I’ve been wondering how to the boil the perfect egg for years! Thank you so much. I boiled some tonight and they turned out perfectly! We always try to keep some hard boiled eggs around the house for egg salad or just as a snack and I’m always trying to perfect my technique, this looks pretty fail safe! STEAM eggs for 20 minuets. Put in cold water. Use now or refrigerate. This will give no green rings and EASY TO PEEL eggs every time. Even fresh eggs peel easily after being refrigerated. Don’t have a steamer – no worries. A pot, stainless colander & lid work just fine. I have never layered the eggs in the colander, but I can do enough for our needs at one time. Another trick I learned from http://www.cheenachatti.com/recipe/hard-boil-eggs/ is to add little baking soda to the water while boiling. This will help in easy peeling. You can also try it next time, it worked for me. Thanks! worked perfectly, used a little rice vinegar in the pot and let sit 13 min. Eggs came out of the shell quite easily. I am going to try the steam method next. I still struggle so hard with boiling eggs so I’ll definitely try this method! Thanks! I love eating boiled eggs every day and I could never figure out how to boil them without breaking the shells. Your tips have saved me. Thank you again! Theres an awesome way to peel eggs! You just make a small hole at the top and a bigg hole at the bottom and blow on the top and the egg will come shooting out perfect! What temperature did you cook your eggs? Was it on like high till they boiled? I actually use a piece of thread to cut the eggs. It gives you an even cut and no jagged cuts. Hope this helps. Boiled 2 fresh eggs after peeling them found a sky blue little round mark on each one. Anyone know what this is? The eggs were fresh, double yolks. Called the egg farm and they weren’t sure. They said it could be a seed the hen ingested……boiled 4 eggs, only 2 had those blue round spots!??? The best way to remove the eggshell is to put an egg into a jar. Cover 3/4 of the egg with water. Put the lid on and shake it. The shells come off easily.